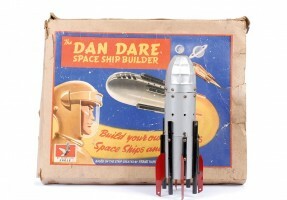 Welcome back to yet another of my listings covering just some of the amazing number of Dan Dare toys. Since the early days of my original posts detailing Dan Dare toys, see parts 1 and 2, I have been asked on numerous occasions about other toys bearing the name of the ‘Pilot of the Future’ so here are some more to whet your appetite. 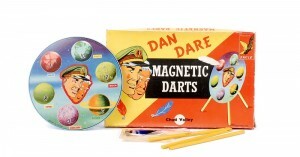 The Magnetic Darts game, officially licensed by the ‘Eagle’ comic, was produced in England by the Chad Valley toy company in the 1950′s. Consisted of a full colour tinprinted target on a three legged stand with 3 lightweight magnetic darts. Produced by Crescent Toys the Atomic Jet Gun (water pistol) was an officially licensed product by ‘Eagle’ comics. 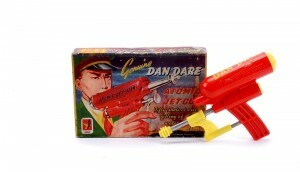 A red and yellow plastic pistol with ‘Dan Dare’ yellow transfer lettering to the top of the barrel and ‘Atomic Jet Gun’ to the sides. Claimed to give 50 shots at one filling of water. Rare item and even harder to find in its illustrated box. Fully licensed by the ‘Eagle’ comic this film strip viewer came in the shape of a plastic spaceship. Made in England by J. & L. Randall under their ‘Merit’ toys banner. 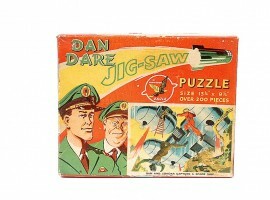 One of several Dan Dare jigsaw puzzles available. 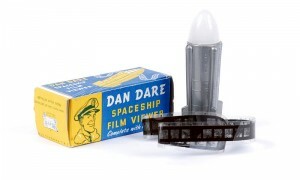 This particular one – ‘Dan Dare and Sondar Capture a Space Ship’ – of unknown manufacture – perhaps by Peter Pan ? measures 13.75″ x 9.75″. Licensed by the ‘Eagle’ comic. Manufactured by A. & M. Bartram this licensed product was a metal construction set which allowed you to build your own space ship. Metal components came in red, black and silver from which a variety of different space ships could be built. Another rare item especially boxed. 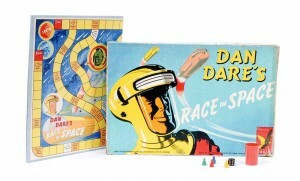 This fully licensed product this was a board game produced by Chad Valley in the 1950′s. Nothing complicated about this game just a case of starting from Earth, using your plastic rocket counter, its the first to reach planet Mercury whilst avoiding various obstacles on the way. To be continued ………….. see part 4 Yet Still More Toys !